Great shot and words Milli. What a gorgeous bed!!! Thanks for stopping by :-). With such a gorgeous bed to lie in, one might be willing to tempt the fates. Hm...??? Beautiful bedroom! Beautiful picture. I love everything in it. The chest the bed, the throw. I just want to sleep in that bed. wise words indeed and such a lovely bed you've made. mind if i take a lil nap? 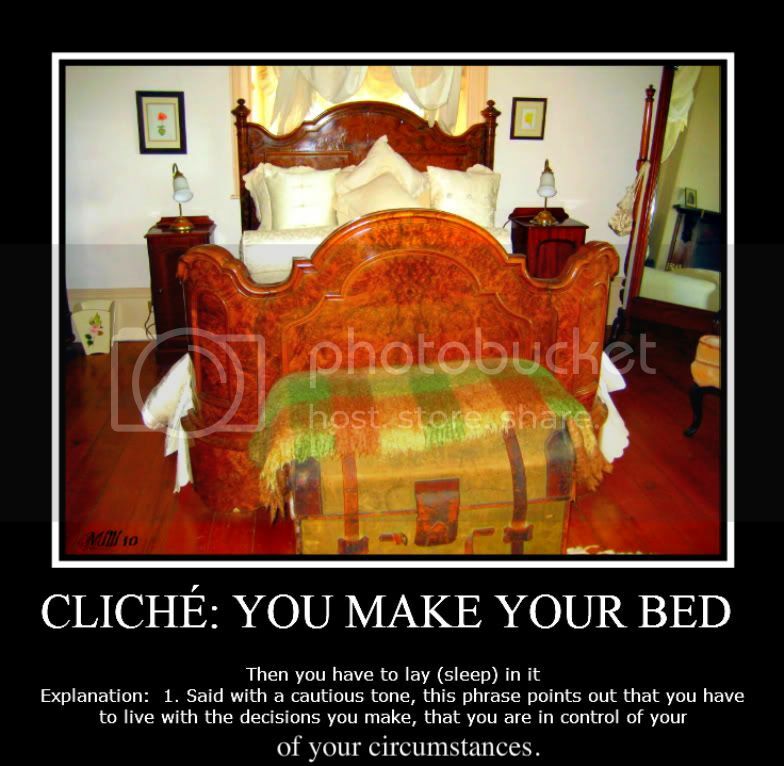 Great take on the theme and depiction of your cliche! Wow! What a lovely bed! It looks so cozy and embracing :-). And is that a fireplace I see reflected in the floor mirror? Love that wonderful bed. And your words are good too. Absolutely fabulous. Indeed if you are not careful you might end up hip-deep in it. Great quote. Thanks for ur comment, dear! How many bounces before trampolining out? WOOOOW what a gorgeous bed room and wise words. Thanks for your visit , have a nice day. Very nice photo and clever cliche! life is about choices, eh? And what a beautiful bedroom. Love the furniture!